How do you know when you need new tires? We’ve got a trick: Insert a penny into the tread, head first. If you can see Lincoln’s head, it’s time for new tires. Look your tires over every four months or so to make sure they’re in good shape. If you see worn treads, cracking sidewalls or other obvious wear, come see us. You also want to keep your tires rotated, aligned, and inflated, as uneven wear can lead to problems with your car’s balance and ever-worsening gas mileage. Chapel Hill Tire keeps your car in the best working shape, likely for better prices than you can find at a dealership. Our experts will check your tires for free, and if we think you need new tires or tire services, we’ll have an honest conversation with you and work out the best solution for your budget. Chapel Hill Tire also offers innovative services like NitroFill™ inflation. 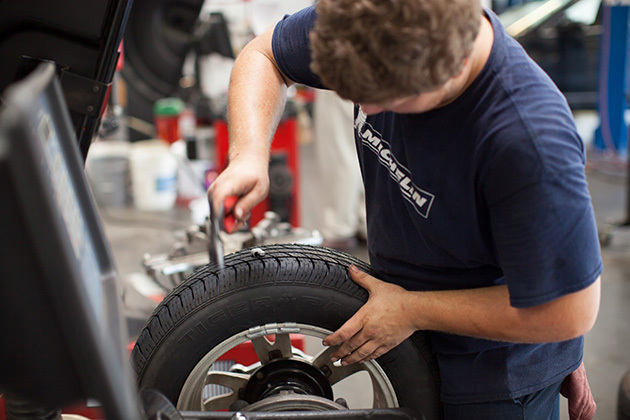 We can replace the air in your tires with nitrogen, which improves their lifespan and performance, helps your gas mileage, and makes them less likely to blowout on the road. New customers get $20 off their first visit with us. We also offer a 3-year/36,000 mile service warranty—three times as long as most dealerships.